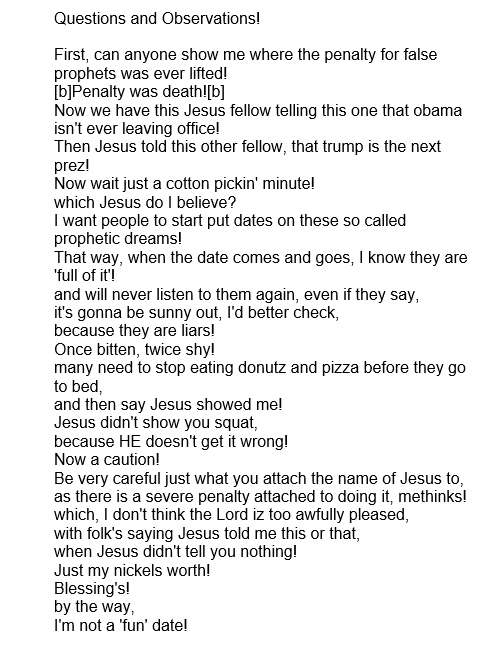 This week a question was posed on a Christian Forum by one of its members, Sky Pilot, which was promptly deleted before any of the other members had a chance to respond. At Tracking the Leopard Meroz, we are reposting this question in order to allow a free discussion of the subject matter. A proper answer to the question posed, requires a familiarity with both the Old and the New Testaments, and an understanding as to why a Christian might approach a particular issue differently than an Israelite who lived under a theocracy set up by the same God. Just as a reminder, I would like to note that forums, chat rooms, blogs, and blogtalk radio programs belong to the person who sets them up; and like a private home, the owner has the right and privilege to set the rules as to who sets foot in their home, and what speech is allowed. Thus the secondary question here is not whether or not the forum owner has the right to delete a question they do not like; they do have that right and privilege. The question I have in regard to Christian internet websites, is whether it is wise in the long run to censor a legitimate question posed by a commenter or forum member, when the question involves searching the Scriptures for greater understanding of present day situations. The members of the body of Christ are to be edifying to each other, to instruct, to warn, to care about each other’s welfare. None of us have all of the spiritual gifts, we need each other, and we need to learn to search the Scriptures together. The following is a screenshot of the forum post written by Sky Pilot. Anyone who has any thoughts on the question which he asks, is invited to comment on this website. On August 9, 2015, I wrote a post called Doug Hagmann:A Man In Deep Trouble in response to an insight which Doug Hagmann had provided into his own soul as he wrote about Planned Parenthood. I commented, But what is most interesting about Hagmann’s article is the darkness of his own philosophy. This he discloses in his opening sentences, saying, “As an investigator and in particular, when I was working as an operational asset for the FBI in the 1990’s, I was particularly good at securing covert video like that captured by the Center for Medical Progress of Planned Parenthood. In fact, I was used because I could convincingly present myself to the subjects of investigation as someone I was not, and secure the needed evidence that served as the basis for immediate raids, arrests and sometimes later, as courtroom exhibits for a jury to see”. So who is this David Daleiden who is finding himself at the receiving end of civil lawsuits and criminal investigations, and why is Doug Hagmann personally relating to this man’s woes? If you are unfamiliar with the background of this story, a quick introduction to David Daleiden, is found on Wikipedia. In this post, I link to several articles on the web which provide interesting facts on this story. However, because the abortion issue is highly charged, the reader should be aware that most articles do not reflect impartial journalism and reveal a bias in their analysis. She adds, “Rossum told Yahoo Health that he was immediately impressed with the young man he describes as a “bright and able kid”. Daleiden took one of Rossum’s courses in the fall of 2009; Rossum describes him as “a basically quiet student. There was no pontificating there on his part whatsoever.” The topic of Daleiden’s senior thesis, which Rossum described as a “tour de force, a great piece of work.” was personhood in American abortion law and jurisprudence…”. On May 7, 2013 the Internal Revenue Service granted a charitable tax exemption to The Center For Medical Progress located then at 5325 Elkhorn Blvd, 305, Sacramento, CA 95843 and assigned an EID # 46-2252984. This information can be located on CMP’s Donate page as well as a copy of form 1023 showing that for the years 2013, 2014, and 2015, revenues were $120,000, $80,000 and $80,000 respectively, totaling $280,000. The Chief Executive Officer, David Daleiden received a $30,000 per year salary for each of these three years; whereas the Chief Financial Officer, Albin Rhomberg and the Secretary, Troy Newman were paid $-0- . The total for Expenses for 2013, 2014, and 2015 under the professional fees category were respectively listed as $50,000 and $10,000 and $10,000. For each of the three years $40,000 was identified as expenses not categorized. Thus apart from the salary paid over 3 years totaling $90,000 to the CEO, we are not provided with the details as to how the remaining funds totaling $190,000 were spent. 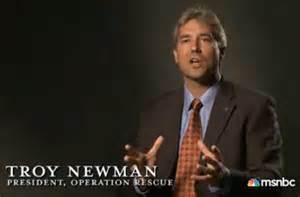 Troy Newman’s bio can be found at Wikipedia, stating that he was born in 1966, and is President of Operation Rescue. Newman was raised Roman Catholic, but later joined the Presbyterian Church in America (PCA). He attended Whitefield Theological Seminary, graduating from Maranatha Baptist University, and apparently worked for a time as an electronic engineer in the aerospace industry. 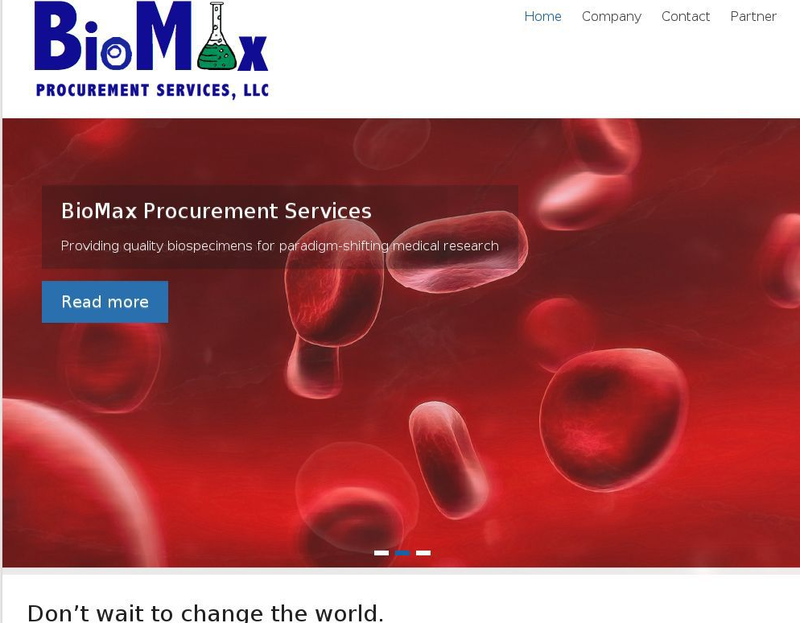 On October 11, 2013 a company called BIOMAX PROCUREMENT SERVICES LLC registered with the California Secretary of State under filing #201328910257 and is still active. On 4/9/2016 when I looked up this company, the CA SOS noted that the Registered Agent had resigned as of July 7, 2015. The website, biomaxps.com presently is invisible to the public and requires a password to login. Biomax’s IP address of 198.1.97.108 also hosts another company’s webpage, that of cmp.org or The Center For Medical Progress which shows a creation date of 4/23/1998. I am not sure what the explanation is for a creation date of almost 18 years ago. 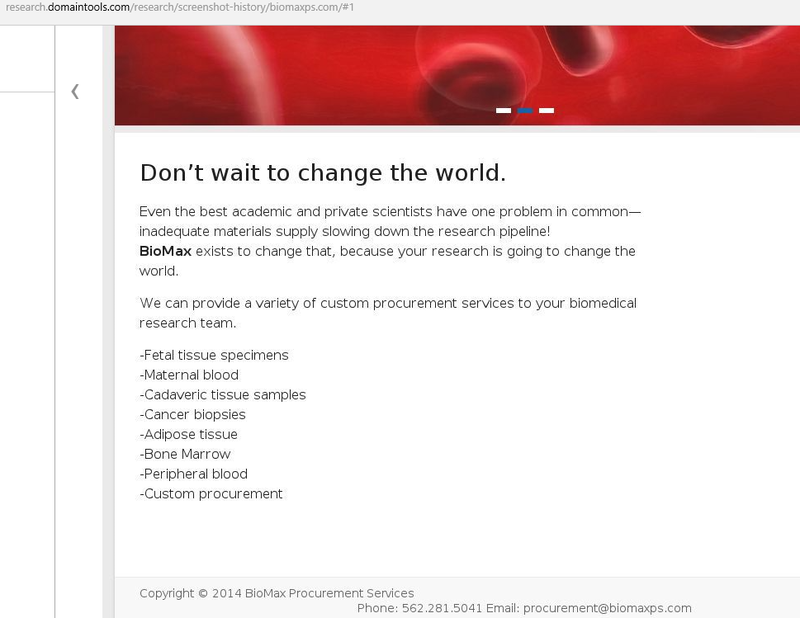 One of the more interesting reads on Biomax Procurement Services, LLC can be found at Rewire News in a July 28, 2015 article written by Sharona Coultts and Sofia Resnick headlined Exclusive: The Faces and Fake Names of People Behind Planned Parenthood Attack Videos. The subtitle of this article says, “Rewire has identified at least three names that appear to have been used as pseudonymns by Center For Medical Progress operatives. One of these names appears to belong to a childhood acquaintance of the group’s apparent ringleader, David Daleiden.” The reader should take a good look at the fake business cards and the photo of fake Biomax employees. 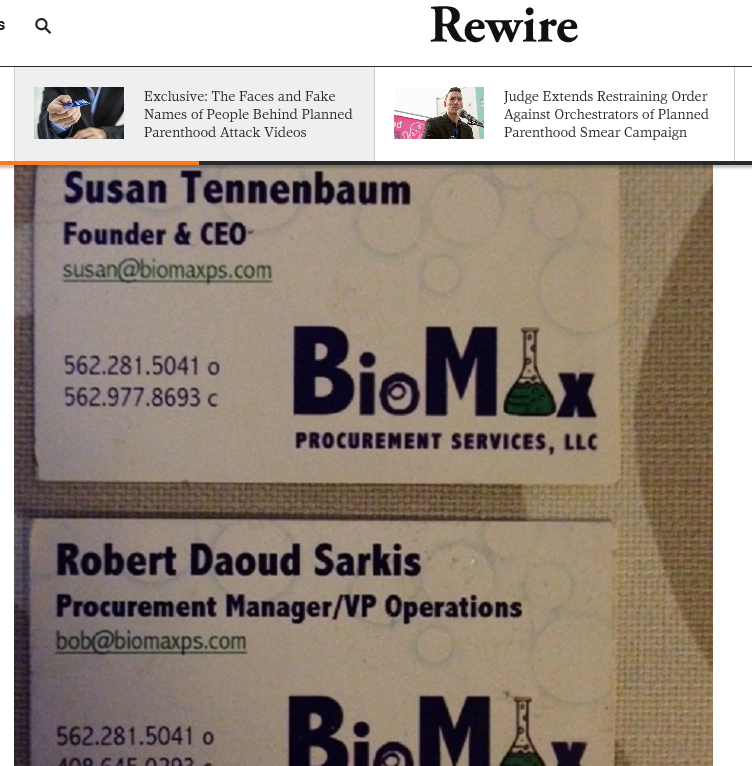 We find for example, that in the prior Rewire News article, a copy of the business card which had been used by David Daleiden as he posed undercover as Robert Daoud Sarkis, Procurement Manager/VP Operations for Biomax. This alias follows him into the world of the courtroom as the National Abortion Federation (NAF) as Plaintiff on July 31, 2015 had filed a court document asking for a temporary restraining order against defendants The Center For Medical Progress; Biomax Procurement Services LLC; David Daleiden (aka “Robert Sarkis”), and Troy Newman. David Daleiden says he was raised as a cultural Roman Catholic, and in high school became interested in abortion issues. Later he became involved in running his college campus’s chapter of Live Action, which conducts undercover activities at various abortion facilities. This group was founded by Lila Rose who later converted to Catholicism from evangelical Protestantism. With regard to these anti-abortion activists, People For The American Way, in their Right Wing Watch column, has an interesting article called The Activists and Their Ideology Behind The Latest Attacks on Planned Parenthood. The connection between David Daleiden and Lila Rose and Troy Newman is detailed in this article. What is interesting when reading various articles about these undercover activities is that several players were recruited as teenagers. While these individuals are bright and full of zeal, one has to wonder if any of their mentors impressed upon them the spiritual and legal implications of becoming undercover operatives. When one crosses the line from being honest before all men, to becoming a deceiver and liar, it is at a great spiritual cost to the soul, as well as to the reputation of Christianity. When the line is crossed from volunteerism to a paid vocation, often the heart motivations also change from “freely ye have received, freely give” (Mt. 10:18b) to “having men’s persons in admiration because of advantage” (Jude 1:16b) Are professional liars really heroes? Another interesting article which again mentions Lila Rose is called Meet the checkered activists behind that ‘shocking’ Planned Parenthood video published by dailydot.com on July 16, 2015 by Dell Cameron. What we see when focusing in on David Daleiden are several questionable practices. The first is the setting up of a tax exempt charity with Troy Newman as Secretary. Since Newman is almost twice the age of Daleiden, we would hope to see wisdom displayed in his role as mentor. But an organization which Newman had been involved in at one point had lost its tax exempt status. And here we see a newly created tax exempt charity created and a young man of about age 24, David Daleiden is made Chief Executive Officer. Center For Medical Progress pays this young man an annual salary, while on paper Troy Newman receives nothing. We are not told who those professional fees were paid to. And then tied to this we find a fake company, BioMax Procurement Services, LLC registered with the state of California. We have no idea if any money was funneled through this company, but we do know that persons posed as employees of this company, with fake business cards and fake California driver licenses. There are first hand witness reports as well as video which indicate that David Daleiden AKA Robert Sarkis, encouraged and apparently provided alcohol to the persons which they covertly videotaped. The Digital Media Law Project has written an article on the potential legal liabilities of secretly recording audio and videos of persons where consent has not been obtained. 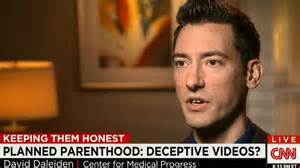 The Inquisitr in their April 7, 2016 article Planned Parenthood: Police Raided Anti-Abortion Activist David Daleiden’s Home Seized “Very Damning” Evidence in fact noted that California law “bans the recording of conversations unless both parties consent or the camera or recorder is in plain sight”. Then there is the problem that the videos made by the Center For Medical Progress and Biomax Procurement Services, LLC reveal severe editing problems which disallow them as credible evidence in a court setting, as reported in this August 27, 2015 dailykos.com article by Joan McCarter entitled Expert Analysis finds Planned Parenthood videos and transcripts doctored by anti-choice group. Sting operations are to be mounted only on persons against whom some evidence of criminality exists and a sting operation is considered necessary for getting conclusive evidence. Permission for sting operations must be obtained from appropriate courts or the attorney general. This safeguard has been laid down since those who mount a sting operation themselves commit the offence of impersonation, criminal trespass and making a person commit an offence. Where there is evidence of editing of tapes and films, there is an automatic presumption that the recording is probably not authentic. As we have observed with the methods of operation of David Daleiden as CEO of the tax exempt charity Center For Medical Progess, and under his false identity as Robert Sarkis, working for a fraudulent company, Biomax Procurement Services, LLC; the tables were easily turned on his so-called investigative journalism. As a result, both civil and criminal investigations into the details of this operation are underway, and the reputation of all anti-abortion activists has been tarnished. The main problem with abortion in America is that a morally abhorrent practice has been legalized. The root of abortion is the common practice of fornication for the sake of fornication, with no real affection for the other person involved. It was not that long ago in America, when a man who impregnated a woman, went ahead and married her, creating a family relationship in which to raise their child. While most certainly the sins of women result in abortions, we seldom hear in all of the abortion rhetoric coming from the so-called Christian camp, that responsibility for unwanted pregnancies also lies with the male. One would tend to think that maybe after all, it really is the Stork’s fault for bringing children into this world. Rather than preaching the gospel, there are Christian anti-abortion activists who would rather glory in their professional acting skills and their ability to lie and deceive others into making confessions, while under the influence of alcohol. Setting up fake identities, using illegal driver’s licenses, registering a fake company with the state, and drawing a salary from a tax exempt charity, causes persons everywhere to blaspheme the name of Jesus Christ, rather than to respect the Name above all Names. It is most unfortunate that the civil lawsuits and criminal investigations into David Daleiden and associates are not frivolous actions, and that the evidence stands in their favor.